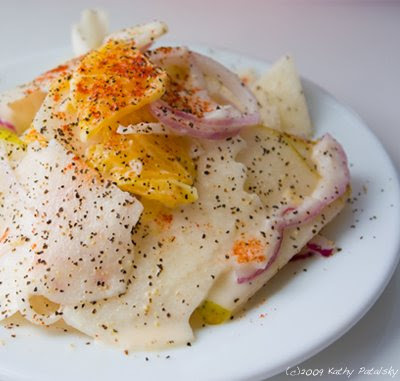 Crunchy Cool Jicama Slaw. Refreshing Side Dish. Vegan. 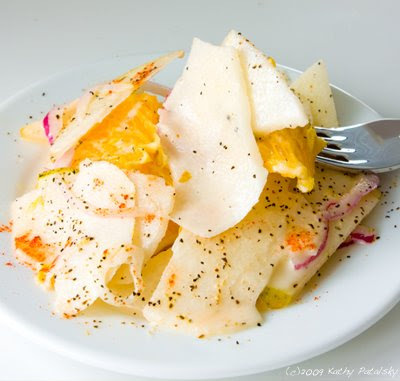 My Crunchy Cool Jicama Slaw is the perfect warm weather side dish. 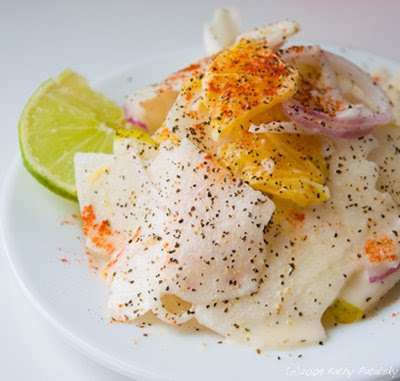 It combines flavors of tart lime, thinly sliced jicama, bosc pear, red onion, citrus, maple syrup, creamy Veganaise and lots of fine black pepper. And the best part about this recipe... is that it takes about ten minutes to make. You can eat it immediately or chill in the fridge. ...Oh and it's healthy too. Lots of fiber and vitamin C. The tart flavors will refresh your palate. 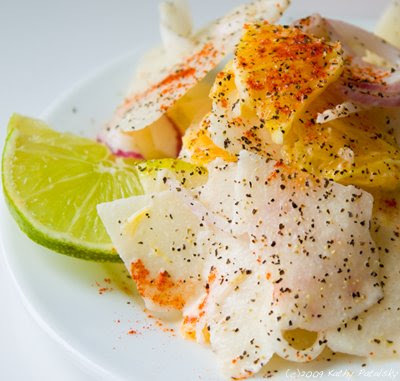 Jicama facts. ...I taste tested it on a foggy cool day, and it was amazing! 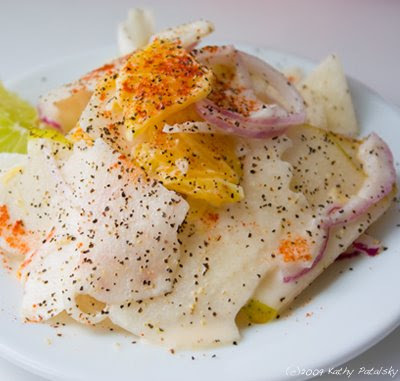 But on a hot spring or summer day this salad will knock the sweaty heat right off your brow. It's such a clean crunchy acidic-creamy salad. It won't wilt up like a traditional Cole Slaw recipe can. 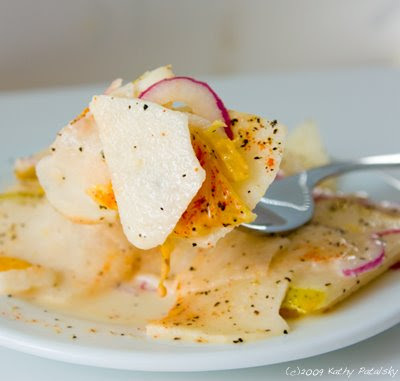 The jicama has a much heartier crunch than cabbage- yet still tastes lighter than cabbage! Prep all the veggies as described in ingredients list. 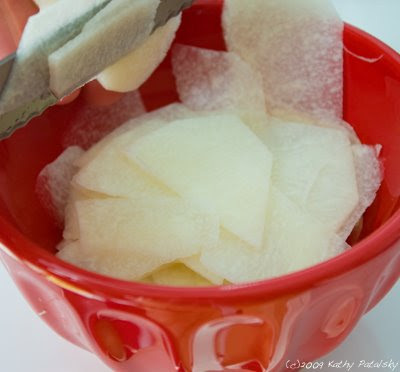 Jicama Virgins: peel like a potato and slice thinly as you would a hard root veggie. 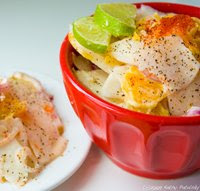 In a large bowl: Toss all ingredients: jicama, orange, pear, onion, vinegar, oil, veganaise, lime juice, pepper, salt and maple syrup. 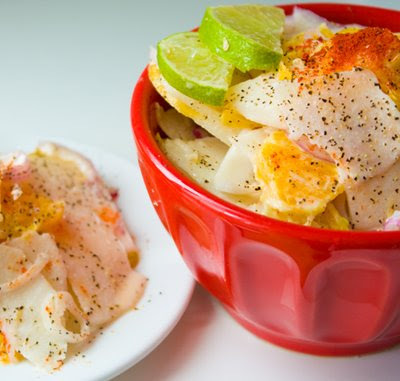 Plate with fresh lime slices and a sprinkle of spicy paprika. More black pepper too. Add-ins: sliced almonds, vegan cheese shavings(white cheese), cayenne for heat, fresh herbs and/or parsley, shaved fennel.